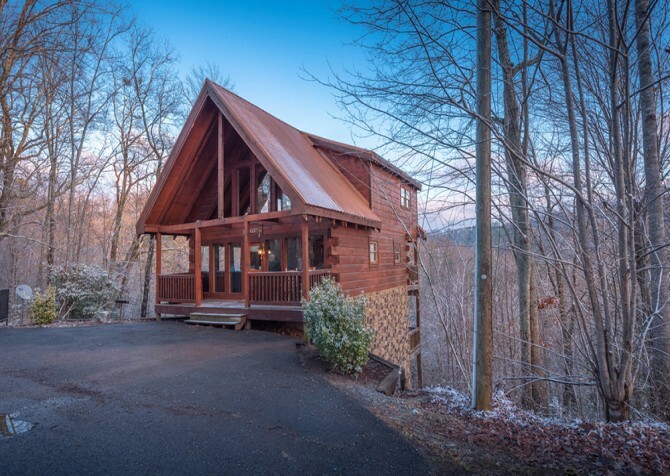 This charming log 2-bedroom, 2-bathroom cabin with space for up to 8 guests is tucked high atop the trees in the Great Smoky Mountains, taking you on A Walk in the Clouds! Soak up your soaring mountain views from this Pigeon Forge retreat, peacefully situated in the Little Valley Mountain Resort. 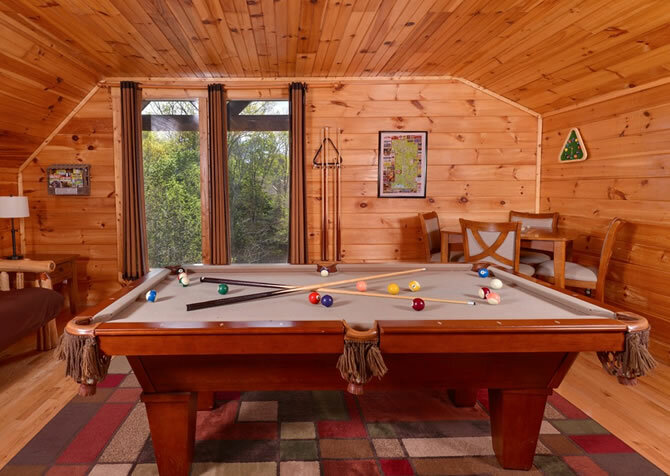 From flatscreen TVs and games to the conveniences and comforts of home, you’ll find all you need for a relaxing and fun escape in the Smokies. 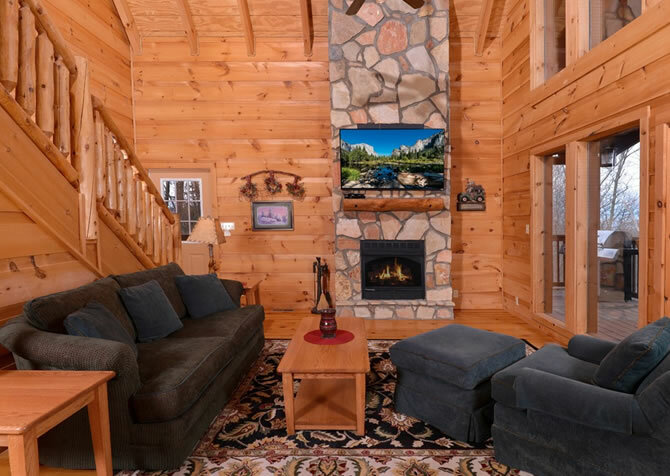 Mountain views greet you at this classic log cabin, and as you step inside, you’ll find a comfy living room with a gas fireplace and big screen TV — and more mountain views! 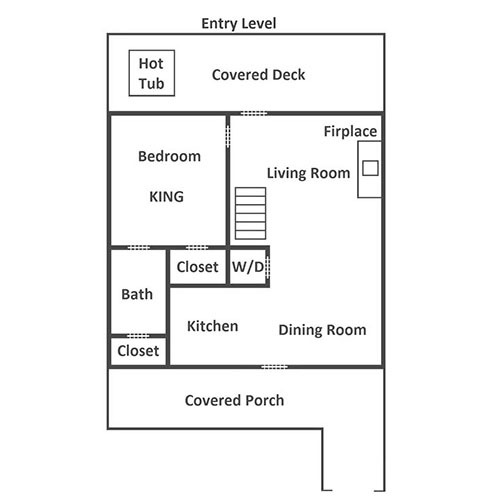 Whip up meals in the fully equipped kitchen, play arcade games in the loft, and enjoy evenings with soothing soaks in the outdoor hot tub on the deck. Love outdoor meals? Sit down at the table on the deck after grilling up your favorites on the gas grill here. With mountain views just a glance away, dining outdoors never looked better! Other conveniences like the king-size beds, wireless internet, washer and dryer, and queen sleeper sofa in the living room for extra space make this cabin a comfortable and cozy getaway for family and friends. Welcome to your home away from home at A Walk in the Clouds — featuring a spacious living room with 2 sofas (one doubles as a queen sleeper), a large area rug, ceiling fan, gas fireplace, and a big screen TV! Settle in for entertainment with the family, cocoa sips by a toasty fire, romantic reads when everyone else hits the hay, and mountain views for days. The hardwood floors and high ceilings bring style and comfort to this open space, creating a communal room where the whole group can gather, hang out, and enjoy good times at the cabin. Rustic yet modern, the galley kitchen at A Walk in the Clouds is fully equipped with everything you’ll need to prepare quick meals, fancy feasts, and midnight munchies. Stainless-steel appliances and a large sink plus pots and pans, cookware, plates, cutlery, mugs, and more are all provided. Brew pots of joe with ease, store fresh veggies for Grandma’s secret recipe in the fridge, reheat restaurant leftovers for lunch in the microwave, bake chocolate-chip cookies in the oven, and toss (with care) dirty dishes in the dishwasher at the end of the day. Just off the kitchen rests the dining area, harboring a country-style table with 6 matching chairs and a chandelier overhead. With an open concept, extra seating can be found easily in the nearby living room. Let the kiddos watch a funny show with their meal while the adults discuss secret plans for tomorrow’s in-town activities! This space is also great for coffee chats, email checks, or morning devotionals with majestic mountain views streaming through the living room windows. It’s time for a bit of old-school fun on the arcade table in the loft! Play to beat the highest scores or challenge your bestie to a few rousing rounds — victor gets first choice at the locally made fudge bought in town! There’s also a twin bed with a trundle, perfect for the youngsters who stay up all night to play games. When everyone’s tuckered out and eager to head to dreamland, slip away to one of 2 cozy bedrooms — each with a king-size bed, ceiling fan, and flatscreen TV! 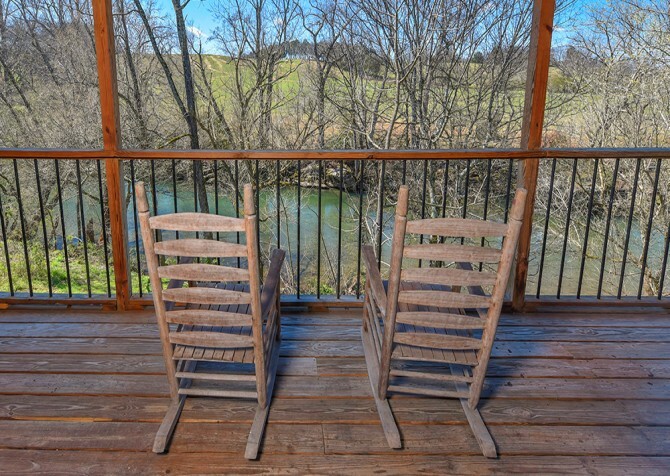 One awaits on the entry level with Smoky Mountain views, and the other rests upstairs with a dividing wall from the rec area. 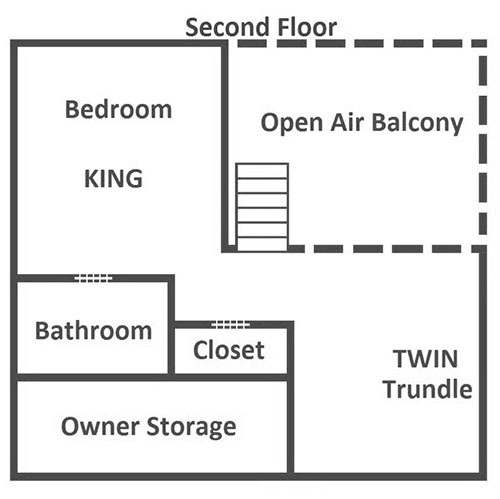 And let’s not forget the twin bed with a trundle in the loft plus the queen sleeper sofa in the living room, providing extra sleeping space for additional guests. Playing arcade games, watching TV in bed, and snacking in the kitchen is all fine and good, but there’s even more fun to be had at A Walk in the Clouds — outdoors! Step onto the back deck, take a deep breath, and exhale that mountain fresh air. After grilling juicy kabobs on the gas grill, set the outdoor table for a meal with friends and spectacular mountain views. Once the food has settled, slip into your swimsuit and rev up the hot tub for a bubbly soak in nature. Ready to paint the town red? Head down the convenient ramp to the flat, gravel driveway with parking for 2 vehicles, hop in the cars, and start towards the heart of Pigeon Forge. It’s time for go-kart races, zipline adventures, mini golf, mountain coasters, and exploring The Island! *Roads to the cabin are steep, so please be prepared, especially during winter months. Located in Little Valley Mountain Resort, A Walk in the Clouds also offers complimentary Wi-Fi and a washer and dryer. Hop online to check out local deals or keep up with the CFY blog and keep laundry fresh and clean throughout your entire stay. Less than 8 miles to the hustle and bustle of downtown Pigeon Forge, A Walk in the Clouds offers entertainment for the whole family, a plethora of dining options, and shopping galore only a short drive away. Witness live (and happy) goats on the roof while soaring, twisting, and turning through Smoky Mountain trees aboard The Coaster at Goats on the Roof! Play The Escape Game, dine at Paula Deen’s Family Kitchen, enjoy a drink at Yee-Haw Brewing Company, and kiss atop The Great Smoky Mountain Wheel at The Island in Pigeon Forge. Belly laughs, chuckles, and knee-slapping giggles await at The Comedy Barn Theater, an award-winning (and family-friendly) comedy show in the Smokies.